Have you been washed by Jesus? And, have you been so personally ministered to by him, that you know you are clean, and you know you are his? And, have you been humbled by his gracious intimate love towards you? 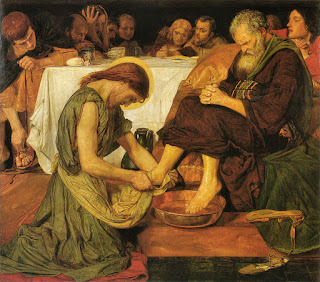 Jesus' washing of the disciple's feet gives us the example to follow of voluntary, humble, selfless service. Washing peoples feet is something you did not do, unless they were your children or it was your wife or father. 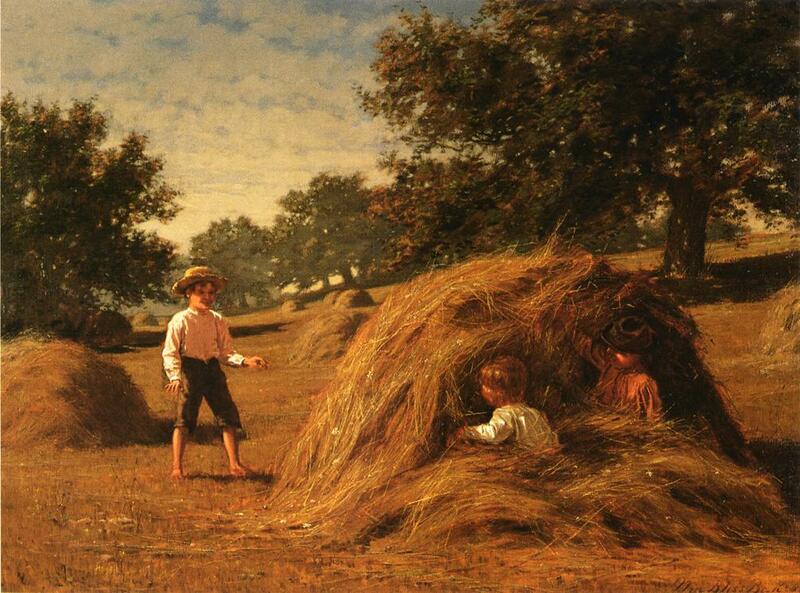 People had servants who would do this work, and Jewish people would reserve this low work for Gentile servants. It was the lowest act of service. As an act of extreme devotion, followers might wash their master's feet; never the other way around (Kruse, p. 280). The washing of the disciple's feet, by Jesus, occurs during the meal. Jesus took off his outer garments, and began washing each man's feet. It must have put these men in stunned silence, until Peter could not hold back and had to say something, when his turn came. You may be a person like Peter, who can't help but speak up and say, "wait a minute", or "this isn't right". Peter literally said, "Do YOU wash MY feet? "(Barret, p 440). Peter is in the very bad position of refusing a profound gift of love and service. Imagine saying to Jesus, that you are happy to be in his church, to be part of his group, and that you would even die for his cause; but you don't want him touching you, you don't want him too close. It is a strange kind of pride to refuse a great gift. Jesus is stern when he says to Peter, that if he does not allow him this intimacy, if he does not receive this act of love and service, then he can not be a part of him. Today, if someone has the attitude that they don't need Christ's washing, they are saying they don't need Christ. The whole reason he came was to cleanse us. So, it becomes ironic if that person says they are a Christian. To enter into fellowship with Christ we must be washed. We cannot belong to him unless he has washed us. And we must belong to him. It sounds humble to say, "You don't have to do that", to Jesus; but it's really pride. Pride says, "I will wash myself". Proud people do all kinds of washing of themselves, but that is not what Jesus wants. He wants to wash us. Unless he touches you and cleans you, you are outside the kingdom. Washing each others feet is not a sacrament or a ceremony, but a picture, a lesson, or an illustration of the command from Jesus for us to love one another in humble service. It is also more than an ethic for, a test of, or a guide to humility. We must wash one another's feet, figuratively; after we have been cleansed by Christ, because this is his command that we love one another. We learn here, that no one who has not been cleansed, can be in the fellowship of Christ. Unless he cleanses you, you have no place in him. There is no belonging without this cleansing, that comes through Jesus' blood shed on the cross (1 Jn. 1:7). The message or lesson in Jesus' washing their feet is that we all need to receive the cleansing that Jesus brings to us through "his self-humiliation on the cross"(Kruse, p. 283). Before he washed their feet, they understood him to be their teacher and Lord. After his washing their feet, he wanted them to have a new understanding about the teacher and Lord that he is: a servant. Jesus' statement, "Very truly I tell you, no servant is greater than his master, nor is a messenger greater than the one who sent him", is that his followers, starting with the apostles, are to be servants, following in his footsteps of servant-hood. "If their Master and their Sender does lowly actions, then they, the servants and the sent messengers, should not consider menial tasks beneath their dignity. This saying (with variants) is found on four occasions (here, 15:20; Matt. 10:24; Luke 6:40; and cf. Luke 22:37). It was evidently a saying that Jesus loved to repeat"(Morris, p. 552). Jesus imparts knowledge by coming along side, showing and telling, until we know it. But, it is not enough to know it. We are only blessed if we do what we know. This is one of the two beatitudes in John (the other is 20:29).